Many student accommodations are tight on space. Knowing how to utilise the small amount of space you have is vital. There are plenty of solutions, some costing nothing and others a small price. Using the walls is a perfect solution to a lack of space. Hanging items up on walls, and the back of doors, will keep your floor space free. Some accommodations will allow you to put up hooks on the walls. For those places that will not allow this you can buy self-adhesive hooks, which are simple to remove when needed. There are other types of hooks available, including over-the-door hooks. These hooks will hook over your door and give you space to hang coats, bags and anything else. Stacking boxes on top of each other is another fantastic way to save space. Plastic boxes that safely stack on top of each other are easy to come by and are often fairly cheap. To keep these boxes organised you can label them. Having too much furniture in a small space can become frustrating, especially if you’re constantly walking into it. Desks that can be folded up are ideal, as when you’re not using your desk you can fold it up and have more space to move around. 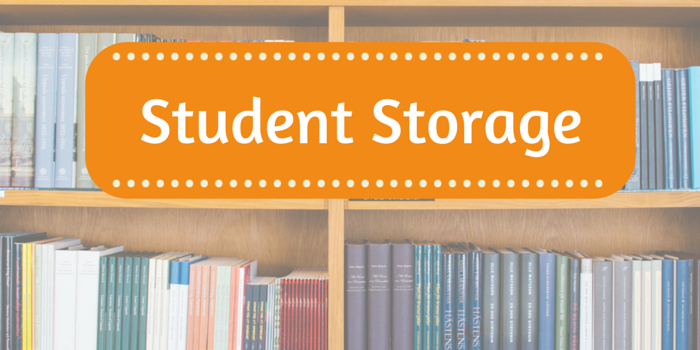 A student storage unit is a great place to store items that you need to keep with you but don’t have the room for in your accommodation. You will have access to your unit for most of the day. You are also able to rent whichever size unit fits best for you. Whether it’s a small locker, for a few text books and old notes or a larger unit, for extra furniture. If you’re a student in Cardiff, Swansea or Leicester, find out more about our storage options and great student rates. Remember when adding more storage furniture into your accommodation, to measure the space available so you don’t add too much furniture and end up with no space. It is important to also restrict yourself from buying and hoarding too many items. This will also result in not having any room left.